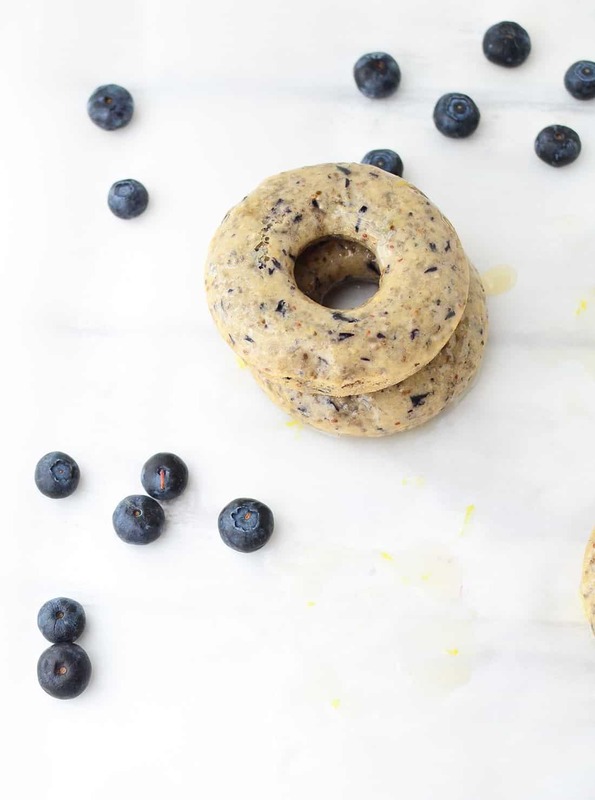 These donuts are proof that if you own a donut pan, you will inexplicably start craving donuts. On the reg. I never liked donuts. No, really. When BL and I lived in our old place, sans a laundry room, we turned Sundays into laundry day. Which, I think sounds much more nostalgic than it really was. Besides getting to spend quality time with my sweetie sorting and folding, we would always head to the donut shop next door to wait, chat and sip coffee. However, I honestly don’t think that in the year-and-a-half of weekly visits we ever ate a donut. Coffee was enough and neither one of us craved the idea of a pastry. So, since purchasing my donut pan last fall why have I discovered a weakness for donuts? Why do I now love the idea of a lazy laundry-free Sunday morning with coffee and donuts? So naturally, I’m giving in to the craving and going for it. After making my Pumpkin Donuts with Pecan Frosting (which BL said was one of the best pastries I’ve ever made), I wanted to follow up with a more seasonally appropriate flavor. Blueberries and Lemon! Sweet, tart, and the perfect base for a cake-like donut. I knew that I wanted to make a vegan donut so that everyone could appreciate them, but I wasn’t sure where to start. 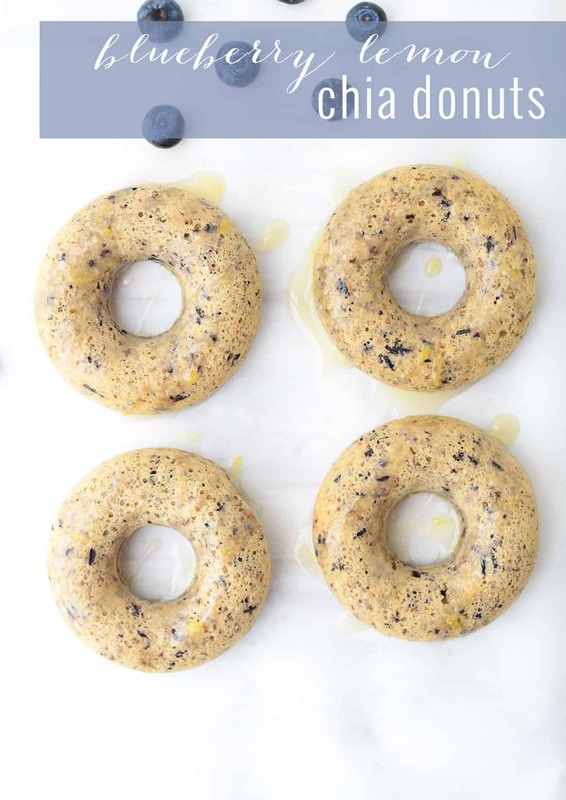 Then I remembered the chia-donuts from the Oh She Glows cookbook and knew that would be the perfect base. 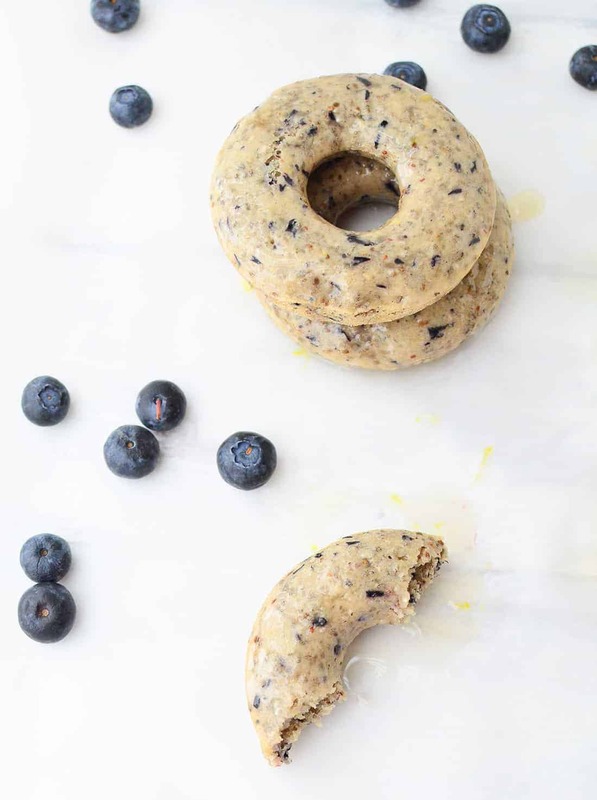 The beauty of using chia seeds is that besides the extra boost of Omega-3 fatty acids, they give the donut a bit of crunch. These remind me of a cross between a muffin and a donut. Slightly tender, a little chewy, but with enough bite that you know these are definitely donut material. If you like cake donuts, you are going to love these. 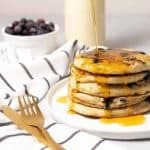 To get the blueberry flavor in every bite, you will pulse the berries together with almond milk and vanilla in a food processor or blender. If you over process it, it’s OK, but your donuts will be more blue than specks of blue. Feel free to use frozen berries here, just make sure they are thawed and drained first. To finish it off, I made a simple glaze of powdered sugar and lemon juice to drizzle on top. Sure, that adds a little more sugar to an otherwise healthy donut; but honestly, I can’t imagine these donuts without it! It seeps into the donut so that every bite is a little bit cakey, a little bit gooey. These are so addicting, I’ve managed to polish off three while I was photographing. Yup, the girl who never ate donuts in the past decade is now having three in one morning. If anyone needs a donut pan, I know where you can find one. 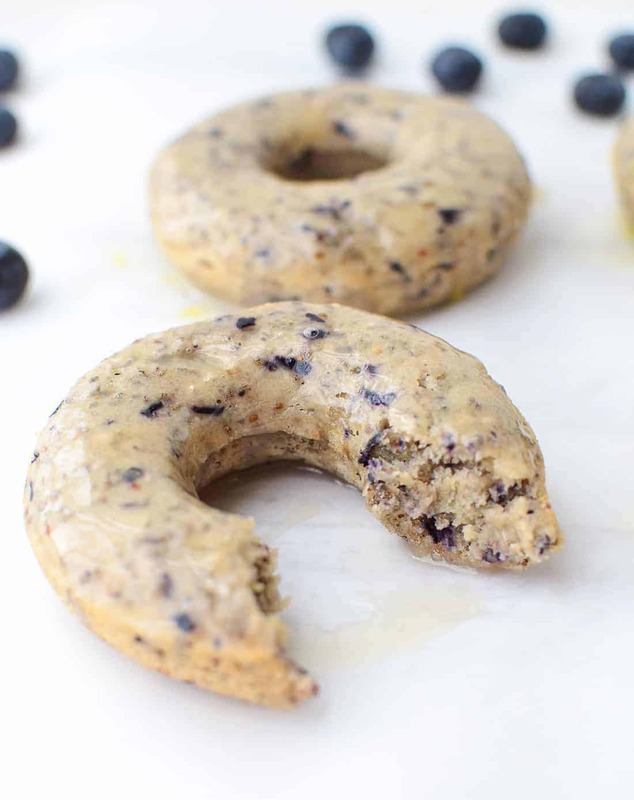 Blueberry Lemon Chia Donuts! 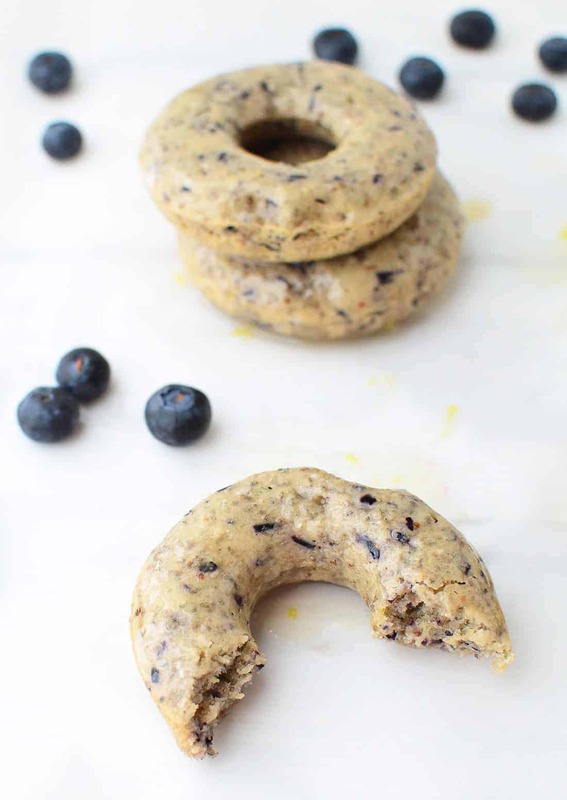 Vegan cake donuts that are packed with fiber and omega-3 fatty acids! Perfect for breakfast, snack or dessert! 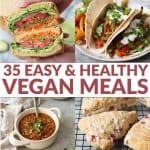 Adapted from the Oh She Glows cookbook. 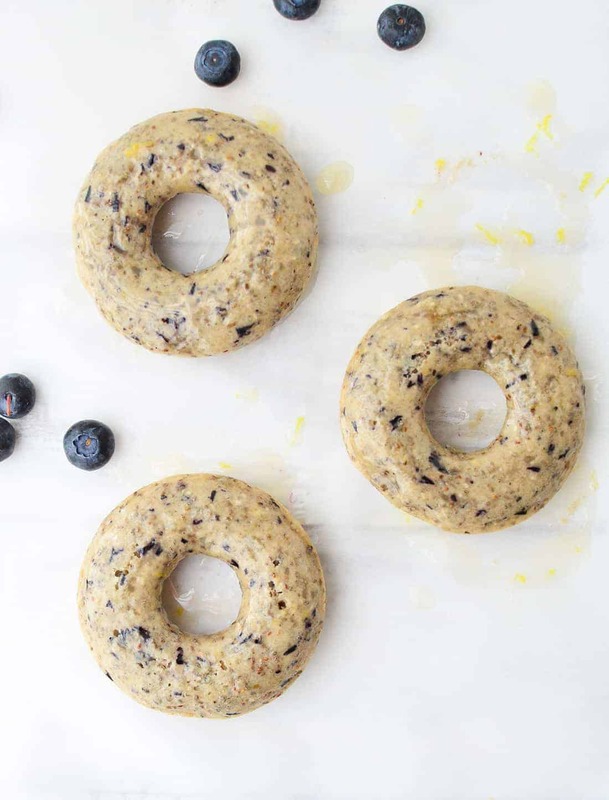 Combine the flour, baking powder, salt, nutmeg, chia seeds, and fresh lemon zest. Whisk to combine. Place the almond milk, vanilla extract and blueberries into a blender and pulse a few times to combine. Whisk the blueberry mixture into the flour bowl and stir until combined. Spoon the batter into a greased donut pan or place into a large plastic bag, cut off the corner, and pipe into the donut pan. Bake for 11-12 minutes until golden brown. Cool donuts on a wire rack for 5-10 minutes. While donuts are cooling, whisk together the powdered sugar and lemon juice. Dip cooled donuts in glaze and eat! I never like donuts either! Then, I bought a donut pan to make some for Todd because there aren’t any vegan donut shops up here in Alaska of course and now…love donuts! I think it’s because baked donuts are pretty much just cake..hehe. These look incredible, Alex. What a perfect flavor for spring-time! They remind me of those delicious lemon, blueberry bundt cakes! So beautiful too! I actually received a donut pan in our family Christmas grab bag this year and have yet to use it!! I guess you’d say I’m not a big donut lover, but these sound delicious! These look amazing. It’s a good thing I don’t have a donut pan or else I would totally make these (and probably eat every single one myself). Well you know I love homemade doughnuts! I love this combo! So perfect for Spring! how long do you bake them – doesn’t say…. Do you think these would work with gluten free flour ? Hi Julia! I have no idea, I only tried them with the flour seen here. If you try them with GF flour, let me know how it turns out! Hey! Just noticed that you left out the brown sugar for (I would guess) Step 2 to be mixed in with the flour and such. Thankfully I realized it before I transferred the dough into my pan!